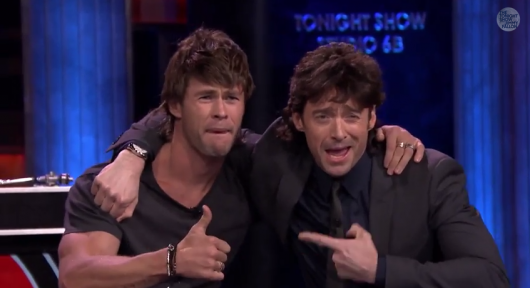 Hugh Jackman and Chris Hemsworth donned mullet wigs for a game of Musical Beers, an alcohol-tinged take on Musical Chairs, along with Jimmy Fallon and current SNL cast members Colin Jost, Kate McKinnon, and Bobby Moynihan. Avengers star Chris Hemsworth is hosting Saturday Night Live this Saturday. Hugh Jackman visited The Tonight Show with Jimmy Fallon to promote his new film Chappie, which opens today, Friday, March 6. The videos are here below. Watch!